"When I was measuring out the dimensions of my current home in September 2012, I realized that the main room was 20′ by 32′ and that this would make a nice Tetris playing field if the ceiling were made out of 2′ by 2′ light up tiles. 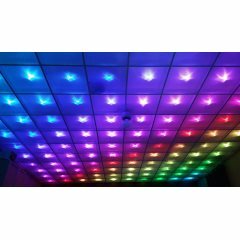 I figured I could use opaque suspended ceiling tiles with a single RGB LED pointing down on to each one. With that thought planted in my head, all I needed was the time to design the electronics and build it."